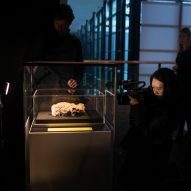 Creative agency KK Outlet has created a series of low-budget horror movies telling the story of the Whitechapel fatberg – a 130-tonne lump of fat that has just been acquired by the Museum of London. 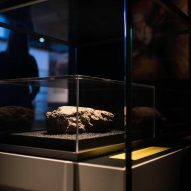 The Museum of London is now exhibiting a large chunk of the fatberg – a blockage of solid waste made from congealed fat, which was discovered in the sewers of east London last year. London-based KK Outlet was tasked with developing the branding and marketing for the show. Their response was a series of short movies in the style of fuzzy, low-budget horror pictures. 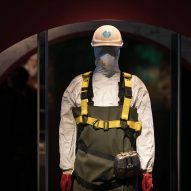 The longest of the tongue-in-cheek movies tells the fatberg's story, from its creation in the sewers to its arrival at the museum. The film begins with a man scraping his meal into the toilet. A bright light then shines out of the toilet – alluding to the birth of the fatberg. The scene then cuts to a series of actors filmed dramatically screaming at the camera, followed by a group of people in the street running away from the fatty mass, which the studio created using a "few litres of custard". 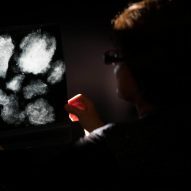 A series of accompanying, shorter films were also created, including one where fatberg drowns both a human and a cat. As well as the movies, KK Outlet created posters for the exhibition. Reading "FACE THE FATBERG" and "FATBERG IS COMING", the posters feature a blobby typeface designed to replicate the look of the lump of fat. The Whitechapel fatberg was first discovered in London's Victorian sewers in September 2017. 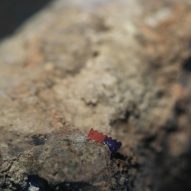 Measuring 250 metres wide, it contained objects such as condoms, tampons and food waste. Immediately after it was revealed, the Museum of London launched a campaign to acquire some of the mass. This campaign was backed by Dezeen columnist Will Wiles, who said the fatberg was as a reminder of how sophisticated Victorian engineering has liberated people from having to think about waste. 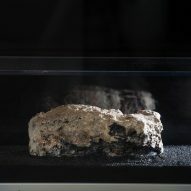 The fatberg is now on show at the museum as part of an exhibition named Fatberg! 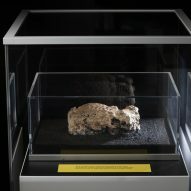 According to curator Vyki Sparkes, the aim was to chart the history of fatberg, which she described as an "unseen growing monster that lives in the sewers". 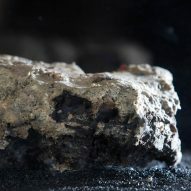 "Fatbergs are usually removed and destroyed, so it has been an incredible challenge to preserve for display the last remaining piece of the Whitechapel fatberg," she said. "But, as the Museum of London, it's important that we display things that reflect the highs and lows of living in the city, today as well as in the past." "Fatbergs are disgusting, fascinating things which mark a particular moment in London's history, created by people and businesses who discard rubbish and fat which London’s Victorian sewer system was never designed to cope with." Sparkes also wanted to give insight into the process and extensive work it takes to clear the blockage – putting hazmat suits and power tools on show alongside the fatberg samples. "The first thing you see is a mannequin dressed in all the protective clothing you have to wear when you enter the sewers to battle a fatberg, and also the tools used to destroy it," she said. "Parts of the Whitechapel fatberg was set so hard that jet powered hoses couldn't shift it – Thames Water workers had to take in micro-tools for the confined space." Fatberg! is on show at the Museum of London until 1 July 2018. KK Outlet is the London-based arm of international creative agency KesselsKramer. Based in Hoxton, the studio combines a communications agency with a gallery and bookshop. Previously, the studio commissioned seven designers to create a collection of unofficial commemorative china for the wedding of Prince William and Kate Middleton in 2011, including one featuring the 'Like' feature from Facebook.